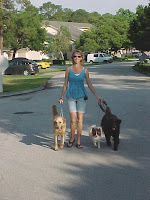 All Things Dog Blog All Things Dog Blog: A Dog Walking Support Group:Join us! I Found a Dog Walk Support Group! Just when I think I've seen everything, I find something so incredibly creative that I have to share it with you guys this very minute! What's totally cool about this finding is that it never would have happened had I not popped in at Brown Dog CBR to read their acceptance post for the Stylish Blog Award. While perusing their list of bloggers to pass on the award to, I found this gem: Lessons from 4 Legs. Those of you who know me well know that I am always preaching (encouraging!) exercise in a variety of ways. Katie, at Lessons from 4 Legs, has created a support group of sorts for less-than-motivated dog walkers. To join in you simply comment at her announcement post with a goal for 2011 miles to be walked, and add your URL, so she can list you on her sidebar. I'll be jumping into the walk group as of April 1, just after this round of Spring company heads back North. Little do my boys know, but they'll be wearing pedometers while we hike, backpack, bike and walk, for the duration of 2011. Well, on second thought, maybe I'll wear the pedometer. I decided it would be tough to include swimming miles; that's okay; we'll call that extra credit. Tanner and Oliver will be getting plenty of extra credit in our backyard lap pool, as Tanner takes a dip most days--playing fetch--while Oliver runs the length of the pool, telling him what a nut he is for being in that wet stuff. Enough on our miles; what about you? Anybody up for joining me in this challenge? Let me know if you decide to hop in. I'm hoping it will prove to offer great lessons, as the site's name says. Katie's approach is pretty informal, but she does ask that we report in periodically, so she can update our miles walked in her sidebar. I added her badge that you see above, to my sidebar. If you decide you're interested in joining in, just scroll down to the badge and click. You'll magically find yourself at the right place to plug into a group of walkers that will hopefully keep you motivated to meet your goals. There's something about peer pressure, huh? Great idea, Katie. We're ready to go! Thank you for the info. on this! We are so excited. Cocoa & Oreo pledged to walk one mile a day starting tomorrow until the end of the year! Yay! Thank you for sharing.